Following up with a second bar from local chocolate and candy company NutWhats, this week we have their Ocumare 92% Cacao bar. How could I resist getting a 92%? Such a higher percentage ends up being a test to use for categorizing companies--and when the style of a bar in the lower 90% range aligns with my tastes, this can be one of my favorite cocoa percentages. We have the same style of packaging this time, just with a different pattern and purple foil instead of red. Using this colorful foil and this type of paper then allows for endless possibilities of looks that will all still be recognizable and distinct. 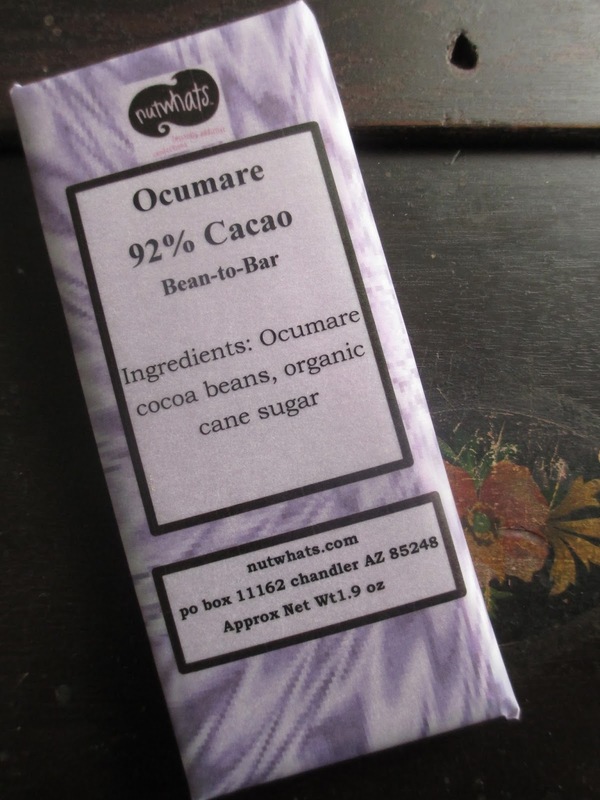 While the label does mention that this cocoa is sourced from the Ocumare de la Costa Valley in northern Venezuela, there is nothing this time about the cocoa being fair trade or organic. Unless we just don't have official labels for this one (which is possible), then those traits don't apply here (it would be nicest if they did). The color is darker for this bar than it was for the other. While the aroma is deeper, as well, this one, interestingly, doesn't have that bitter twinge. The initial hit on the tongue, though, is bitter (and floral). The strong bitterness is reminiscent of Lindt's 99% Cocoa bar, of which I was never a fan. Past the halfway point, the flavor does get a little warmer and mellower. The flavor notes are plum, strawberry, and caramel. I don't catch all of that. A general berry flavor, which is similar to plum, perhaps, but strawberry? No. And caramel? Generally that's a sweeter flavor note, usually for milk chocolate; I don't pick up any caramel here. Naturally, of course, if you move on to a second bite, your mouth will already be attuned to the flavors, so the bitterness will be almost completely gone. Yet still I find this chocolate either too dark or just not in the right style for me. Mainly I find it only to have a very dark chocolate flavor, which isn't what I like from a 92%. I like for high percentage chocolate to lure me and coax me and romance me, and that just isn't what the flavor here does. They did get the texture right, though, I must mention. 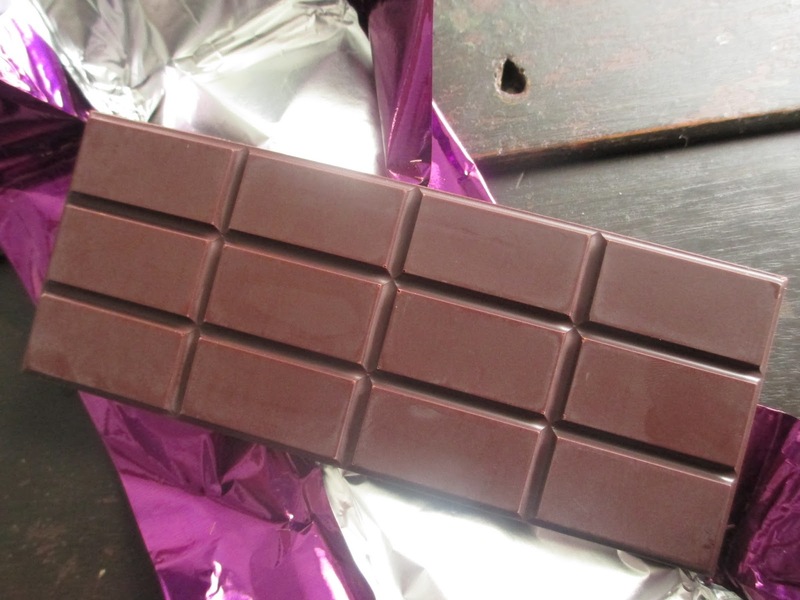 Texture can start falling apart when you start getting into high cocoa percentages if you're not careful, and yet this bar has the same type of smoothness that the lighter bar had. It doesn't have that almost crumbly texture that Lindt's 99%, for instance, has (granted, 99% is higher than 92%). I'm left to conclude here that the style of this bar just wasn't my style. Give it a try if you like to flirt with bitterness; otherwise I would suggest staying with the lower cocoa percentages like the Peruvian 82% from last week.